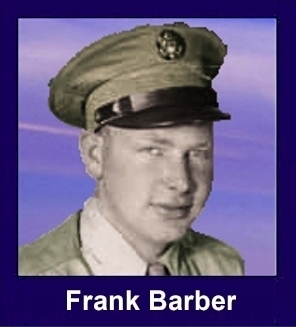 The 35th Infantry Regiment Association salutes our fallen brother, PFC Frank E. Barber, 373321354, who died in the service of his country on April 29th, 1945 in Luzon, The Philippines. The cause of death was listed as KIA. At the time of his death Frank was 23 years of age. He was from Renville, Minnesota. The decorations earned by PFC Frank E. Barber include: the Combat Medical Badge, the Bronze Star, the Purple Heart, the Asiatic-Pacific Service Medal, and the World War II Victory Medal. My Uncle Frank had lost an eye as a child and didnt have to enlist in the Army, but felt he had to as all of his friends had either been drafted or had enlisted. My mother told me that he was a stretcher bearer when he was killed.